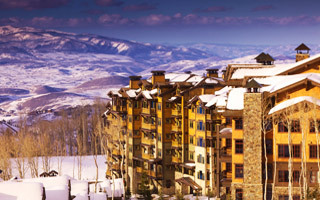 Located in the heart of Empire Pass, Flagstaff guests will enjoy panoramic views of Deer Valley Resort and Park City. Flagstaff has been designed with the sophisticated vacationer in mind by providing direct ski access via the Silver Strike Express chairlift right outside your door. Guests enjoy spacious residences that have been carefully designed with an eye towards form and function. By utilizing native stone and indigenous mountain materials, the interiors of Flagstaff will meet and exceed the most discriminating travelers’ expectations. After a day of skiing, enjoy gathering at The Pub for après-ski activities or relax in the oversized outdoor soaking pool complemented by the sound of a gentle waterfall. Flagstaff has quickly established itself as one of the preferred destinations in the Empire Canyon area of Deer Valley for the ultimate vacation experience. Condominiums feature ski-in/ski-out access, full kitchen, spacious living area, fireplace and are adjacent to the Silver Strike Express chairlift.